73-77 chevelle rear window louvers? Does anyone remember a magazine sales ad for Cragar window louvers back in the eighties? I think they were painted aluminum and only offered in black.Has anyone ever seen any on a 73-77 malibu rear window? That would look pretty wild on the 2 side windows and also rear,kind of like a "Mad Max" or "Death Race" tribute. Re: 73-77 chevelle rear window louvers? Someone here has it. It came from someome here. Window louvers in body section! Uh-huh,I knew they existed.Thank you for the pic. Hey thats my car! I bought those from one of the other folks here. I originally bought a set from JC Whitney back in the 80's for my 77. If anyone knows of a really great Tin man ( furnace/eaves etc) These are relatively easily made and we could all ( .....well those that like them) get a set made. I am a not A Tin guy but did make a set in grade 12 metal shop for my '76 Celica coupe and they looked just fine. I simply don't have the metal brakes or space to build a set right now or I would. Hinges and fasteners would be up to us but are simple to duplicate others. Takes a bit of measuring with some trial and error but if someone has the time.....and facilities......... I'd certainly pay handsomely for some. thecriw wrote: If anyone knows of a really great Tin man ( furnace/eaves etc) These are relatively easily made and we could all ( .....well those that like them) get a set made. I am a not A Tin guy but did make a set in grade 12 metal shop for my '76 Celica coupe and they looked just fine. I simply don't have the metal brakes or space to build a set right now or I would. Hinges and fasteners would be up to us but are simple to duplicate others. Takes a bit of measuring with some trial and error but if someone has the time.....and facilities......... I'd certainly pay handsomely for some. My son wants a set for his 76 Celica coupe but they are very rare and if someone has a set they will not sell them. Biomedtech wrote: Hey thats my car! I bought those from one of the other folks here. I originally bought a set from JC Whitney back in the 80's for my 77. Hey that was me... sold them to you for $100... I hope you are still enjoying them! 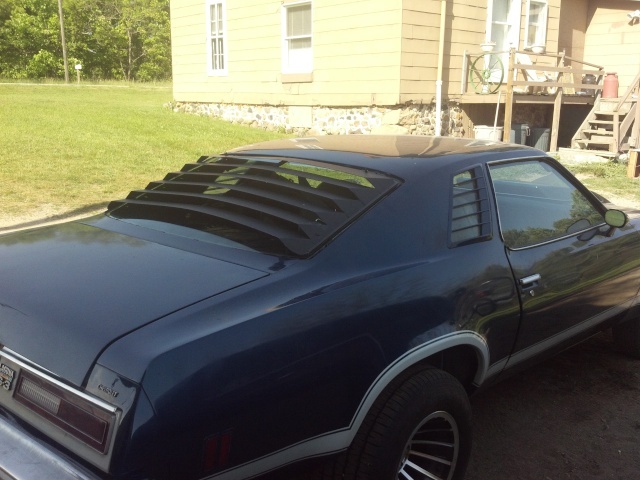 When I bought my '73, 16 years ago, a brand new rear window louver in the box came with the car. Sold it on ebay for less then $100 if I remember correct.